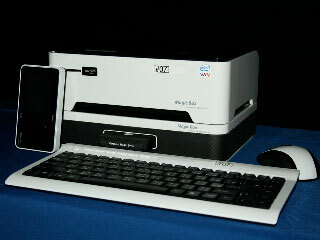 The Magic Box is actually two units: a fully functioning computer that detaches from the media server base featuring a 2.5-inch HDD bay, two-way speakers and a USB port for connecting it to other PCs. A high performing, energy-efficient Intel Core 2 Duo processor allows for a compact design that fits unobtrusively into any room of the digital home. A remote control not only controls Windows Vista SlideShow, but also provides instant status updates on your computer from up to 30 feet away. If you want untethered access to a compact, sleek PC and digital media player/server, The Magic Box just might be your People’s Choice.